The Department of Defense is soliciting proposals for a computer program that would allow small children whose parents are in Iraq or Afghanistan to "interact" with a virtual version of their missing parent. It is a poor substitute for the real thing, but the US government is hoping a "virtual parent" could provide emotional support for the children of servicemen and women while they are away on active duty. The challenge is to design an application that would allow a child to receive comfort from being able to have simple, virtual conversations with a parent who is not available "in-person"... The child should be able to have a simulated conversation with a parent about generic, everyday topics. For instance, a child may get a response from saying "I love you", or "I miss you", or "Good night mommy/daddy." You don't believe me, do you? Go ahead and check the link. It's real. It's real and it's virtual. DoD wants a program that tricks the child into thinking they are interacting with mommy or daddy when in fact they interacting with a computer. The idea is that this will improvethe situation for the forlorn child. Think of it as a Turing Test for the toddler set. The Turing Test was originally posited by British computer pioneer Alan Turing, who suggested that a reasonable bar for announcing the arrival of computer intelligence would be when people would be unable to distinguish electronic communications with people from electronic communications with machines. But even Turing, visionary that he was, did not predict that an intermediate step along the way to machines passing a Turing Test would be machines fooling toddlers into thinking that their parents expressing love for them when actually they were engaged in a firefight in Afghanistan. 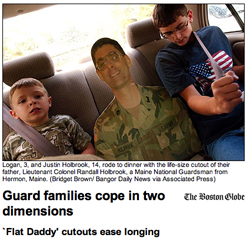 The new virtual parent would be the successor to the "Flat Daddies" that have been provided to some children of deployed military personnel since 2006: life-size cardboard cut-outs of the missing parent. Which brings to mind the "Ceremonial Bugle," the military's hi-tech solution to what is apparently a bugler shortage in the US military. The "Ceremonial Bugle" has a digital sampler embedded inside. The idea here is that if you get killed in Iraq and the army has no bugler on hand to go to your funeral, they send a soldier in dress uniform to hold the bugle up to his lips and then discreetly push a button that triggers the playback of a recording of a bugle playing Taps. Or as Deputy Assistant Secretary of Defense John M. Molino puts it, "In addition to the very high quality sound, it provides a dignified 'visual' of a bugler playing Taps." You can order one of these marvels for your own personal use starting at a mere $525. And you can see one in action at a real funeral here. Note that the bugle is one of the world's simplest instruments. No valves, no slide, no moving parts. All you can do is play notes from the harmonic series. 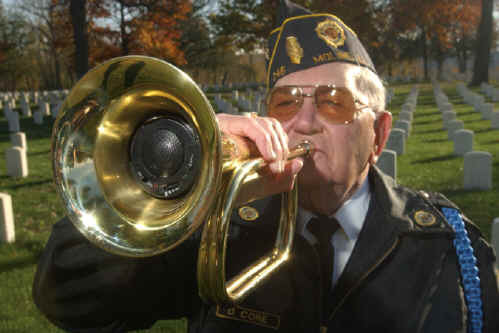 Taps and all other military bugle calls have just 5 notes. Our military leaders train our soldiers to use infrared night vision goggles, operate combat robots, fly F-16 jets, and fire cruise missiles, but apparently getting those 5 notes out of a bugle has our military-industrial complex flummoxed.